Black & Decker CTO6335S is an easy to use compact sized oven with stainless steel design that provides compactness, style and performance in a single package within affordable price. The number of features like large digital display, convection cooking, auto timer and one touch preset gives you a wonderful cooking experience with no worries. Regardless of the compact size, as it seems, it is roomy and is large enough to easily bake a 12 inch pizza. The control panel of the oven has digital display which provides user friendly controls and interface and the large display makes it easily visible even from a distance. It allows the user to easily manage or select the different functions. It can be easily customized according to the requirement. This oven provides a great cooking experience as it has the convection cooking technology that cooks the food evenly and it takes less time by circulating the air evenly around the food. It also saves energy and time. It is worth mentioning that this option is off in the normal cooking mode. It can be turned on when required or it is active for specific cooking options. When the cooking is completed the convection cooking mode is automatically turned off. The oven comes with an indicator light which shows the current status of the oven. The different colors of the light show the different functions or the status of the oven. The oven has 120 minutes automatic timer, it allows you to set the time according to your need and it is automatically turned off when the cooking is completed and lets you know by ringing the bell. It also has preinstalled automatic timer settings for the commonly cooked or baked items. It allows you to just select the thing which you are cooking and the rest of the work is done by the oven itself. The oven is lit by an interior light which lets you easily see the food while it is being cook. You are not required to open it again and again to have a look at the food. The adjustable thermostat provides the user to set the temperature according to his specific need in a wide temperature range, which allows you to bake, toast, broil or just use it to keep the food warm. It has a professional design heats that ranges from 200 to 450 degree Fahrenheit, having 5 degree increment levels. The non-stick coating in the oven makes it reliable, easy to clean and easy to cook such food which gets stick to the pan or the tray. Now you can easily cook anything which is difficult to cook and to clean off the mess afterwards. The oven is equipped with dual position rack slots which give you two options to place the food according to the heat requirements or the size of the food. Like other models, this oven also has a removable crumb tray which can be easily cleaned after cooking. What Do Owners Say About the Black & Decker CTO6335S? Convection – The best praised option which makes this oven stand out is the convection function which keeps the heat even and allows the user to bake evenly at lower temperature in less time. Convenience – The customers also love the convenience it brings. The digital panel makes the controls and functions easy to use. It can be easily placed anywhere in the kitchen because of its compact size while it still has enough room inside to bake a 12-inch pizza which requires a bigger sized oven. The long 120-minutes timer allows you to cook anything which requires a lot of time without coming to kitchen again and again, you only need to set the timer and let the oven do its work. No Pre Heating – This oven doesn’t requires pre heating like the big ovens, so If you need to bake or cook something small you can easily use this oven instead of using the old styled big ovens which require time for pre heating. It is one of the best options in the size of a toaster providing the uses of an oven. If you are having a party at home and the larger oven is being used then this small oven can come handy and you can bake anything in it instead of waiting for the other one to get free. Hot Housing – Hot Housing is a common fact of ovens that is complained by most owners. The stainless steel body and lack of insulation of the oven makes it hot, sometimes it gets too hot that touching it can cause you severe burns but it should not be considered a major problem because most of the ovens are heated as it is used for cooking. So to avoid any injury it should be placed in a proper ventilated place providing room around the oven. Size and Ringer – In my research, I also found that the size of the oven is not suitable for cooking a turkey. The ringer of the oven has an annoying sound so it should be placed somewhere that it doesn’t disturb anyone sleeping in the living room. Other Inconvenience – Some customers think that the controls are difficult or not much user friendly, this issue can be easily solved by consulting the user manual, once you go through the user manual you can easily use the oven after that. One of the other drawbacks is the power cord which is too short, its length is only 24 inches so you need to place it near a power source or use an extension wire. Who Should Buy and Who Should Not? People who like cooking but have a small family should go for it because it gives a wide variety of cooking options in affordable price. Or the people who have small apartments and bigger oven make them hot in summers should use this as their secondary option. 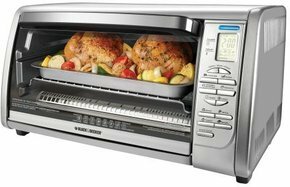 If you have a large family and have large family dinners then don’t buy this oven as it can’t handle large things like turkeys or cooking for a large family. Moreover it also gets hot so if you have a kitchen where the back of the oven is exposed then don’t go for this oven, it can cause serious injuries to the children or even the adults. The Black & Decker CTO6335S has a great performance and quality for the price as it has almost all the features in the lowest possible price. The stainless steel look, multiple functions, automatic timer and temperature control and large digital display make this oven incredible in this price range. The convection cooking technology is a plus point as it and the non-stick coating and the removable crumb tray makes it easy to clean. So overall it is a great product by Black and Decker in the price range the only drawback it has is the heating issue but it can be solved if used properly and proper safety measurements are taken.